Mount Merrion Historical Society, Community Centre, North Avenue. Monkstown–Dún Laoghaire, Tom Conlon. Adm. ?4/?2 student. Military History Society of Ireland, Griffith College, South Circular Road. Who became an officer? Irish recruitment to the British armed forces, 1922–49, Stephen O’Connor. Tallaght Historical Society, County Library. The road to Blessington, John Hussey. Clare & Shannon Archaeological & Historical Societies, Old Ground Hotel, Ennis. Poulnabrone: a tomb for Clare’s earliest farmers, Ann Lynch. Kilmacanogue History Society, Glen View Hotel. Wicklow Birds—part of our natural heritage, Eric Dempsey. Bray Cualann Historical Society, Bray Chamber of Commerce House, 10 Quinsboro Road. AGM + From Poolbeg to Arklow: the Dublin and Wicklow coastline, Brian White, + 100 years of the Glenview Hotel. Adm. ?4. Kilmacud/Stillorgan Local History Society, Glenalbyn Sports Club. Maritime Guinness: ships, yachts and barges of the Guinness family, Eddie Bourke. Adm. ?3. Sligo Field Club, Education Centre, Sligo IT. The life and times of Sir Frederick Hamilton, 1590–1647, Dominic Rooney. Muskerry Local History Society, Ballincollig Rugby Club. Massacre in West Cork, Barry Keane. Adm. ?3. Carlow Historical & Archaeological Society, Seven Oaks Hotel. War and enlistment in Carlow, 1914, Paul Maguire. Clondalkin Historical Society, Arás Chronáin, Watery Lane. The Sabbath disturbed: the Curragh Mutiny, Liam Kenny & James Durney. Howth Peninsula Heritage Society, Angling Centre, West Pier. The life and music of Percy French, Bryan Hoey. National Gallery of Ireland, Clare St.
Ireland in war and in revolution 1912–23, John Horne. The future of the past: Revival Ireland 1912–23, Declan Kiberd. Between Clare and Ayr: Thomas Dermody and Robbie Burns, Mike Griffin. Old Dublin Society, Dublin City Library & Archive, 138–144 Pearse St.
Gone but not forgotten—the Church of Ireland graveyards of the city of Dublin, Raymond Refaussé. Rathmichael Historical Society, National School, Stonebridge Road. From village to suburb: the building of Clontarf since 1760, Claire Gogarty. A history of the Post Office in Ireland, John Lennon. Adm. ?4/?2 student. NUI Maynooth History Forum, Rhetoric House, South Campus. A comparative look at publishing and reading in Irish, Scottish Gaelic, Welsh and Breton, 1700–1900, Niall Ó Ciosain. The impact of war and conflict on Modernism, Sabine Kriebel. The wartime experiences of German artists, Seán Rainbird. The hanging of the Kearneys in Tallaght, 1816, Eamonn Maloney. Kerry Archaeological & Historical Society, Tralee Library. ‘The men will talk to me’—Kerry Volunteers in their own words, 1913–23, Tim Horgan. Dublin schools prior to 1831, Rob Goodbody. Some antiquities of the Military Road from the Yellow House to the Hell Fire Club, Ron Ennis. Adm. ?3. Irish soldiers on film, Capt. Labhrás Joye. The National Gallery during wartime, Alan Crookham. Sir Richard and William Vitruvius Morrison and their remodelling of the Irish country house, Edmund Joyce. Adm. ?10. Great houses of County Cork and beyond, Richard Wood. My father’s war, a documentary made by Tyrone Productions for RTÉ, introduced by Gay Byrne. The Quakers in Carlow, John Smyth. Screening of three films from the Radharc archives. Adm. ?4. Soldiers of Sligo, Cian Harte. 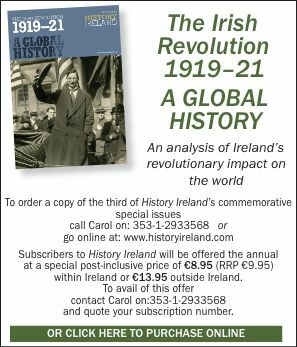 Ireland in war and in revolution 1912–23, John Horne. War and revolution in Russia, Christina Lodder. Palmerstown House and the earls of Mayo, Brian McCabe. Premonitions of 1916 and the Great War in Ulysses (set in 1904), Luke Gibbons. Women in Gaelic society during the Middle Ages, Gráinne Henry. The natural history of Bull Island, Niamh Ní Cholmain. The world upturning: Elsie Henry’s Irish wartime diaries, 1913–1919, Clara Cullen.